Finally! A Cara McKenna heroine I totally like. And bonus - a side female character that I totally really liked too.I am a fan of this author, she has written a few of my favorite steamiest romances. But it never fails that in previous books, there is always something about her heroines that really freaking bugs me. It's usually her heroes and her stories that make up for it. Not this time! The hero, the heroine, the supporting characters who will inevitably get their HEAs in future books. Welllll the plot was a little draggy here and there, but establishing a series can be tricky. I am excited for this series and believe existing fans are gonna love, and so will new McKenna fans. 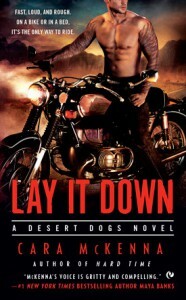 I enjoyed her spin on motorcycle roughnecks, I didn't feel like she was giving us the same old Kristen Ashley (Motorcycle Man, Chaos), Joanna Wylde (Reaper's) and Madeline Sheehan (Undeniable) Motorcycle Club series. These guys just love to ride, and are friends. And are hot and each appealing in their own way. Applause for this new series!